Beany and Cecil was a cartoon that ran from 1962 to 1967. It was created by Warner Brothers cartoonist Bob Clampett based on the puppet characters performed by Daws Butler and Stan Freberg on the popular 1950's live local Los Angeles TV show "Time for Beany." It ran in prime time during the 1962 TV season, and the 26 shows (including 78 cartoons) were then repeated on Saturday mornings for the next five years. 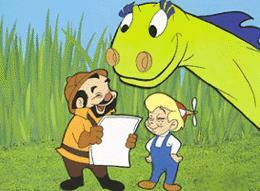 The cartoon featured Beany, a boy, and Cecil the Sea-Sick Sea Serpent embarking on a series of adventures, often to discover ancient civilizations and artifacts. These escapades were rife with cartoon slapstick and countless puns.